Kitchen on Fire has a heart and soul that reaches far beyond its kitchen doors. Giving back to our community fuels our vitality and best of all, giving back is always in season. A passion for providing culinary and nutritional education, regardless of social situations, drives us to reach out to those most in need. Though we host educational, culinary adventures at our Berkeley based kitchens, you’ll also find us in the community teaching those less fortunate how to feed themselves, their families, and even forge a culinary career. The Bread Project leverages the power of social enterprise with training, job placement assistance and support services to help fight poverty. 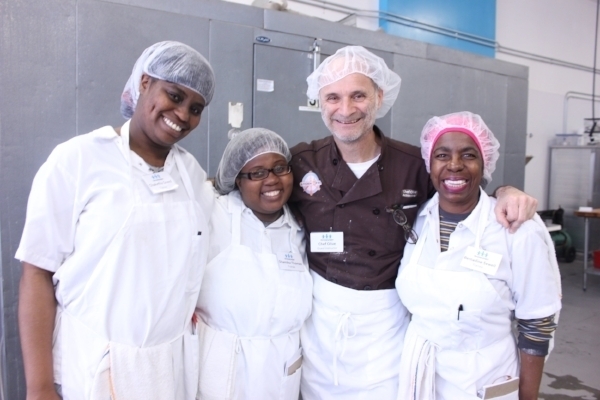 Our award-winning Bakery Boot Camp has consistently delivered industry leading outcomes. Chef Olive with Kitchen on Fire has been part of the Kitchen of Champion Program since its creation in 2007. SVdP provides job training and professional support to individuals from low-income, re-entry and at-risk populations who face barriers to employment. St. Vincent de Paul of Alameda County’s Kitchen of Champions culinary training program is an intensive, comprehensive 12-week session for low-income and disenfranchised individuals, many of whom are formerly incarcerated. The program was created in 2007. Kitchen of Champions uses a combination of classroom instruction and hands-on kitchen food handling safety technique, along with case management, job placement assistance and follow-up services for graduates. As part of their training the candidates are feeding more than 700 people a day, most of these people are homeless. SVdP graduates have been successfully employed by Brown Sugar Kitchen, Everett & Jones, Google Inc., Kitchen On Fire, Ms. Ollie's, Preferred Freezer, Roli Roti, Sears Outlet, and the Waterfront Hotel. 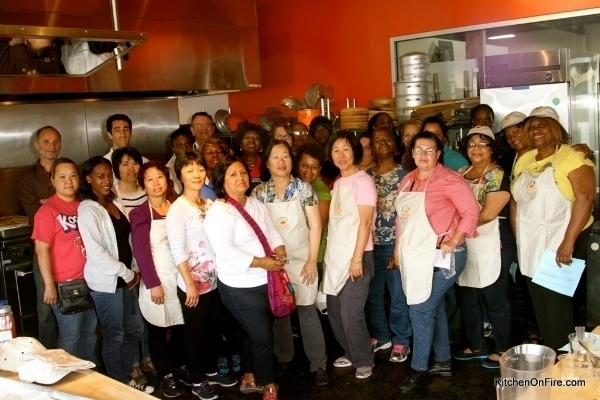 Kitchen on Fire recently helped train 60 chefs from the Oakland Unified District to conduct cooks training at KoF kitchen. This past August our cooks and managers attended a training at Kitchen on Fire in West Berkeley. Chefs Olive and Rick Beeman conducted hands-on lessons on knife and kitchen skills as our staff were introduced to new California Thursdays recipes developed with the help of the Center of Ecoliteracy. It turns out that there is such a thing as a “free lunch”. On Saturday, October 18th Oakland residents convened in Frank Ogawa Plaza to feast on vegetable soup, smoothies, and bread for free as part of an event called Feeding the 5,000. Organized primarily by EndFoodWaste.org, with help from Feedback - a non profit organization whose aim is to end food waste and hunger - the event was the first of its kind in the United States and not only fed attendees but inspired everyone to think differently about food. “A third of the world’s food is wasted, which is an environmental and social disaster,” said Tristram Stuart, founder of Feedback. That’s why organizers and volunteers worked tirelessly to rescue perfectly acceptable food that would have otherwise been destined for trash cans or compost bins. For this event, 2,000 pounds of sweet potatoes, carrots and onions, and 1,000 pounds of fruit were salvaged from farms in the San Joaquin Delta and Salinas Valley, as well as from wholesalers and distributors in San Francisco and Alameda Counties. In addition to the lunch, over 9,000 pounds of produce, also rescued, were given out for free during the event!